Thinking about adding roses to your garden? Now's the time. Roses are just glorious right now. That’s thanks in no small part to the abundance of winter moisture in the North State, as well as our seasonally perfect temperatures that maintain the floral show for longer. Spring is the perfect time to set the stage for even more blooms through the summer months. First, if you don’t have any roses, plant some! Now’s the perfect time to find container-grown flowering specimens — as opposed to bare root. Because they’re in bloom now, you can be sure of the color and also have an idea of plant vigor. If they’re weak in the container, they will be weak plants is in the ground. I am especially excited about my new rose purchase. It’s a variety called Ebb Tide and it is the most perfect purple rose I have ever seen. The next thing to do is to fertilize. Doing so now will support future bloom cycles. Many rosarians agree that Epsom salt-treated plants produce more new canes at the bottom of the plant and darker green foliage. Recommendations on how much to use vary, but generally apply 1/2 cup of granules in spring before the buds first begin to open — so now for many of you folks in the foothill and mountain areas — and 1/2 cup in fall before leaves drop. Or, you can apply a foliar spray now and again after each flowering cycle (1 TBSP per gallon of water per foot of shrub height). Once the fertilizer has been applied you’ll want to give your roses a deep watering to get those nutrients down to where they can do some good. 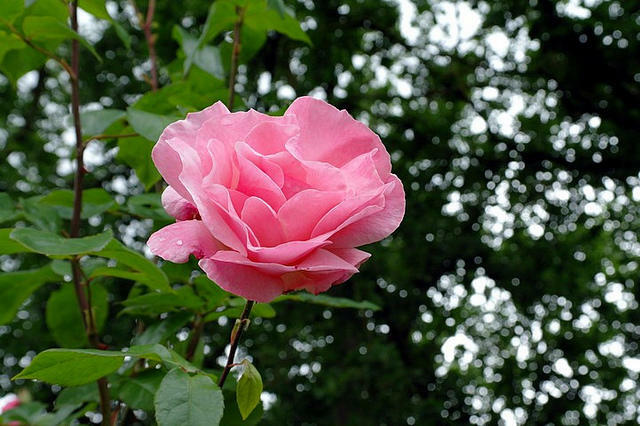 A good rule of thumb is to water at the base of the plant, as wet rose leaves are more susceptible to fungal diseases such as black spot and powdery mildew. If your roses have had fungal diseases, it’s likely they will have them again. Powdery mildew and black spot are most common. A preventive fungicide treatment may include potassium carbonate (baking soda). A horticultural oil such as neem oil can eradicate existing infections and provide some protection. The baking soda fungicide I use is the Cornell formua: mix 1 TBSP each of baking soda, horticultural oil and insecticidal soap together in one gallon of water. Shake the mixture well and use as a spray. To keep the baking soda agitated within the spray solution, add a golf ball inside the spray apparatus. One more common problem: insects that feed on roses in the early season. This year I have seen a lot of caterpillars and aphids feeding on the buds and leaves. Typically, most plants can tolerate some feeding without having to resort to any pesticide application. But if you do treat, try to use the least toxic pesticides such as insecticidal soap and horticultural oils and treat only when and where the insects are most abundant. Codling moth larvae are the cause of the infamous “worm” in the apple or pear and is the immature stage of a small moth. This pest spends the winter as a mature larva in a pupal case on trunks of trees or in debris around the home orchard. When spring temperatures rise in March, the pupae mature and adult moths begin emerging in late March to April. Moths mate and lay eggs on leaves. Eggs hatch several weeks to a month later, and the larvae almost immediately bore into small fruit that has just begun to develop.